In this episode, the gang tries to get to the fictitious town of Phaeacia and secure a boat to sail on home to Ithaca, New York. A quick Google search of the word “Phaeacia” further illustrates the theme of Homer’s The Odyssey in this season of Prison Break. In the book, Phaeacia is the final destination for Odysseus as he tries to return home from Ogygia — much like Michael is trying to get to his safe haven of the seaside town Phaeacia from the Ogygia prison. The Phaeacians loan Odysseus a boat to get back to Ithaca, much like what is happening in Prison Break. Something I’m really enjoying about the parallels to The Odyssey is how subtle they are. Prison Break clearly is not trying to recreate such a timeless masterpiece, nor are they trying to appropriate the story and make it their own. Rather, the writers and producers have taken aspects of the story and seamlessly integrated them into Michael’s story. Nothing feels forced, and I can appreciate that. “Phaeacia” picks up immediately where “Contingency” left off: Michael, Lincoln, Ja, and Whip manage to find a spot to hide from the terrorists who discovered them at the airport. They know they can’t leave that night or they’ll be killed. So Michael says they need to improvise. At the police department in Ithaca, an officer visits A&W’s cell and informs her that she’s made bail. She meets up outside with Van Gough, who was released shortly before her. They watch the video of Ramal’s murder on a cell phone and wonder why Michael killed his supposed ally. A&W scolds Van Gough for questioning Poseidon’s motives and says they only need to worry about their task: killing Kaniel Outis. Michael and the others arrange to hitch a ride with Omar, one of Sheba’s contacts we met at the beginning of the series. He recognizes them as Ramal’s killers and claims there aren’t enough seats in his car to take them to safety — a small town called Phaeacia. He eventually comes to a deal with the group: if they go get Omar’s vehicle parked two blocks away, he’ll drive them out of Sana’a. Omar warns them that the battery will probably be dead, but Michael, Lincoln, and Ja go anyway. Michael asks Whip to stay behind with Omar and load up the car. The brothers and Ja locate Omar’s car easily and discover the battery isn’t dead, much to their surprise; Michael realizes they’ve been set up. Omar knocks out Whip and ties him up. Lincoln manages to dodge their attackers and drive the group out of the parking garage and stop Omar from running away. 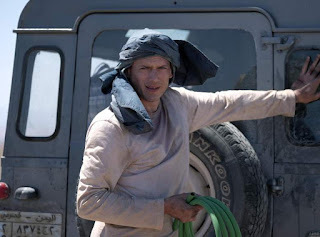 Michael frees Whip, who wants to kill Omar, but the group has no choice but to follow him out since they don’t know the way out of Yemen; the map to freedom is in Omar’s head. At the State Department, Agent Koshida moves into Kellerman’s old office. Kellerman was looking into 21 Void — Poseidon’s rogue CIA organization — before he was killed. Koshida’s boss asks Koshida for the files, thinking Kellerman must have been close since he was murdered. Koshida assures her that it’s full of dead ends, but his boss takes the folder anyway. After she leaves, Koshida calls A&W to follow up on an earlier conversation about the Middle East. Back in Yemen, Ja is struggling with remaining sober during this whole ordeal, but Michael is able to help him. Lincoln receives a phone call from Sheba on C-Note’s phone saying everyone is in Jordan and leaving for the U.S. later that night. She and Lincoln make plans to meet for drinks when he gets back. Little do they know, A&W and Van Gough are tracking C-Notes phone and are therefore able to locate Michael. We learn A&W used to work in the NSA until Poseidon took her away from it to work from him. She and Van Gough meet up with one of her old coworkers for help locating Kaniel Outis. The henchmen and A&W’s ex-coworker have drones watching Omar and Whip in one car and Ja, Michael, and Lincoln in the other. They stop at a gas station to fuel up and Michael insists on going inside to use the Internet. Van Gough calls one of the rebel leaders and tells them where to find the men who killed Abu Ramal. Back in Sana’a, the terrorists are cutting Cyclops loose from Sid’s corpse when they get a radio call explaining Michael and Lincoln’s location. They leave Cyclops behind, but he carjacks a random passerby and takes off. Inside the gas station, Michael video chats with someone named “Blue Hawaii.” We cannot see the person he’s talking to, as he is conveniently having technical difficulties with his webcam. Before Michael leaves, he frantically holds his tattooed hands up to the webcam and asks Blue Hawaii to take a screenshot. Michael exits the gas station to find terrorists flooding the building and Omar bleeding from a gunshot wound. Whip uses the group’s single bullet to shoot at a gasoline tank and it explodes, killing the terrorists. The group notices Cyclops approaching them in the car, and although they can’t make out who he is, they know he’s the enemy. Michael carries Omar to the car and the group escapes. They wind up in the desert when Michael comes to an abrupt stop, informing the other car that Omar is dead. Now, they have no way of getting to Phaeacia. Lincoln wants to head back, but Cyclops suddenly appears and begins shooting at their cars. A&W’s ex-coworker asks how terrorists found Michael and quickly realizes that it’s no coincidence A&W came in here asking for help locating someone and then militants showed up to murder that same someone. She asks the henchmen to leave. On their way out, Van Gough and A&W wonder about why Michael was spending so much time in the gas station. With no cell phone signal and no indicator of where they’re going, Michael, Lincoln, Ja, and Whip stop their cars and take a minute to figure out a plan. They use binoculars to identify their attacker, who they realize is the same man who killed Sid. Michael notes that Cyclops has way more gas than they do, so it’s only a matter of time until they run out. Michael comes up with an idea: drain one of the cars’ gas tanks into the other, so one car will have a full tank of gas. Then, they can make two sets of tracks and Cyclops will have to choose which car to follow. Michael “randomly” decides who will take the car with minimal gas by dropping colored rocks into everyone’s hands; whoever has the white rock will go alone. Shockingly, Michael receives the white rock. He stresses to Lincoln that he makes good track marks so Michael can find them later. Cyclops follows Michael in the white car, and it becomes clear Michael has no idea what he’s doing, and he’s already almost out of gas. Similarly, Lincoln is completely lost when it comes to getting to Phaeacia. Ja realizes there are seagulls flying overhead, and following the birds will lead them to the sea. This strategy finally leads Lincoln, Ja, and Whip to Phaeacia, where they are greeted by a bunch of eager children, thinking Omar is in the car. They get over their initial disappointment and take an instant liking to Ja. Lincoln asks the town’s leader to arrange a boat for them. Back in the desert, Michael stops his car behind some rocks. We don’t know what he’s doing, but Omar appears confused. Finally, the car starts back up again and soon after runs out of gas. Cyclops approaches the car but realizes he’s been tricked; Michael placed a rock on the gas pedal and followed behind Cyclops on foot. He attempts to steal Cyclops’ car, and a fight ensues between the two. Michael manages to stab Cyclops in the eye (heyyyyy Odysseus), and he eventually dies, but not before stabbing Michael in the side. Michael is still able to get in the car and drive off, but he seems like he’s in pretty bad shape. A&W and Van Gough manage to track down the screenshots Blue Hawaii took of Michael back in the gas station. They locate Blue Hawaii, who invites the duo inside. Michael struggles to find Lincoln’s tracks and is quickly losing consciousness. The car breaks down, and he is forced to abandon it and go on foot. In Phaeacia, the group has secured a boat. Lincoln, Whip, and Ja agree that they shouldn’t have left Michael behind and knowing that nightfall will come soon, Lincoln wants to go back to the desert to get his brother. Instead, the group decides to shoot off fireworks, which Michael sees. He manages to follow the light and sounds, collapsing at the foot of the town. Lincoln runs to save him. He looks for a doctor, but the town’s only medical staff is in Sana’a. The final camera shot zooms in on Michael’s face, clearly in pain. He is dying. Well, we are officially two thirds of the way through the Prison Break reboot and I am busy piecing together my predictions and losing hope that Sucre will come back. “Phaeacia” did a great job with propelling the plot. In typical Prison Break fashion, we have a main character on the brink of death with seemingly no way out; however, I’m confident the gang will think up some kind of plan. There’s no way the writers would kill off everyone’s favorite character twice... or would they? No. There’s no way. Michael will get back to Ithaca, remarry Sara, and live happily ever after with his beautiful family. At least that’s my hope. Anyway, after this episode, I’m less concerned with figuring out who Poseidon is and more concerned with identifying Blue Hawaii. I’m fairly confident our villain is either Jacob or Agent Koshida, but we got a glimpse of Blue Hawaii and he doesn’t appear to be anyone familiar. I’ll admit, hopes that Brad Bellick had escaped from drowning in the pipes in season four flashed through my mind for an instant, but I’m a realist. I know that’s not true. I didn’t recognize Blue Hawaii, but we did only see him momentarily and he was wearing sunglasses. Obviously, he is someone whom Michael trusts, someone he’s known for a while, but how easy is it to create relationships founded on trusts when you’re working for a guy like Poseidon and a cause like 21 Void? I think we will get our answer next episode, and I’m already looking forward to it. Lincoln muses to Whip that Michael betrayed him; perhaps this will cause some tension between Whip and Michael. Whip is finally starting to question Michael’s motives and his plan, and feeling betrayed will only intensify that doubt. It is implied that A&W and her old coworker were lovers at one point. A&W’s real name is Emily. This episode is the first real proof we have that the tattoos mean something. Anyone who has watched Prison Break from the beginning knows that in the first few seasons, Michael’s tattoos illustrated the layout of Fox River Penitentiary; obviously, these new tattoos have meaning too. In an earlier episode, it looked like he was copying something from his tattoos onto the paper airplane he sent out to the children outside of Ogygia, but we couldn’t be sure. Lincoln tells the townspeople that Omar had to go somewhere safe because of the war. Whether or not they believe him is unclear.